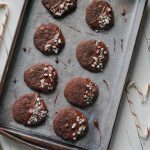 Gluten free chocolate peppermint cookies are a quick and easy gluten free treat made with just 8 ingredients - perfect for the holidays! Place sugar, butter, eggs, and peppermint extract in a bowl. Use a hand mixer to mix ingredients. In a separate bowl, mix flour, cocoa powder and baking powder. Add dry ingredients to wet and combine. Fold in chocolate chips. 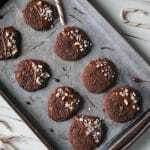 Using a cookie scoop (or rolling into balls), place on baking sheet 2 inches away from each other. Bake 8-10 minutes in preheated oven. See notes above about topping with chocolate and crushed candy cane.